This has been the most racist week in October. Is it just a coincidence or is Halloween becoming a day for racists to openly and decoratively display their racism. It's beginning to look that way, as more and more communities become subject to these degradative acts by people some call neighbors. 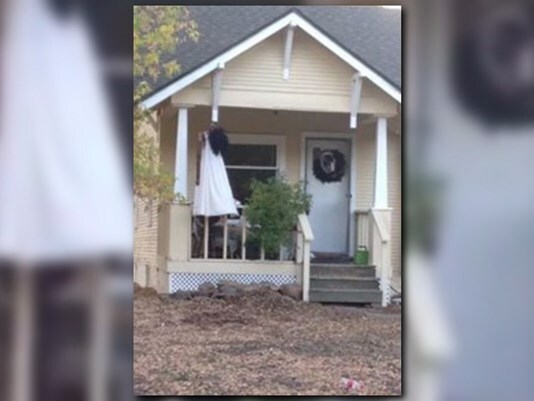 This past Monday, in New York City a Fordham University student thought that a decoratively displayed lynched mummy with coincidentally brown skin, made the perfect Halloween prop for his dorms window. 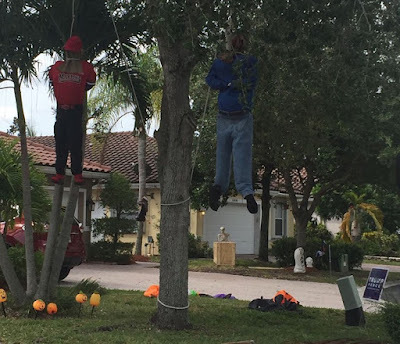 Friday, in Miami's Three Lakes, the community was torn over a dispute involving a neighbor's Halloween decorations displaying two straw dummies lynched from a tree. The dummies appear to be dressed reminiscent to hip-hop culture and have brown skin; one also has its pants sagging. If you look in the bottom right corner of the photo you'll notice a "Trump/Pence 2016" sign. Earlier this month in Fort Collins students from Colorado State University were offended when a house across the street from the school displayed what appeared to be a lynched dummy that looked like a black woman, on its porch. 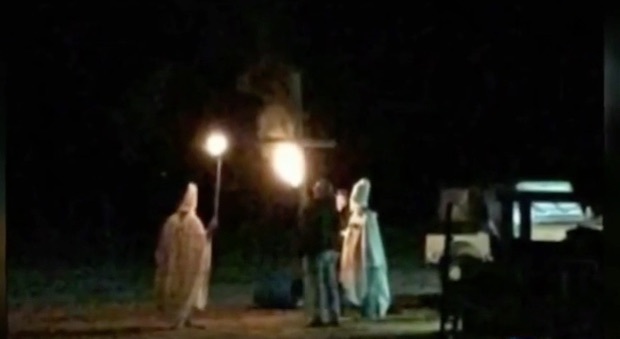 Just last Halloween in Lahoma, Oklahoma the Mayor's husband was caught in a KKK ritual, which coincidentally was downplayed to be an inappropriate Halloween festivity. In 2016 it is evident that racism is just as strong as it has always been in this country. It's there lurking in the shadows disguised as everyday people, neighbors, coworkers, and as we can see from some of these photos politicians. 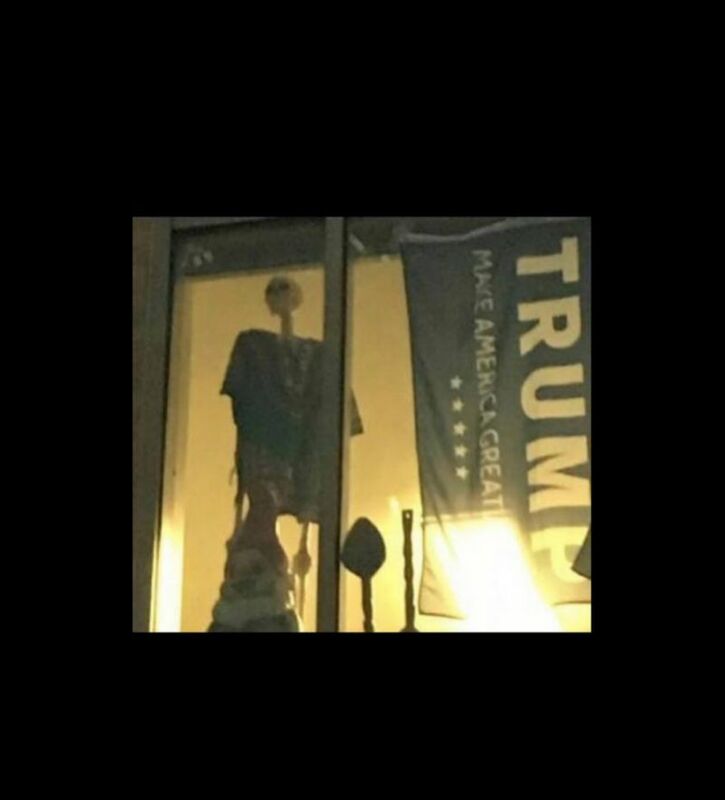 This countries racists look to Donald Trump as if he's America's Messiah and Halloween has become the most racist time of year. 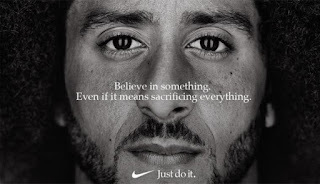 A day for white supremacists to openly celebrate their disdain for blacks.